Recently I had an experience at a restaurant in which I was served a beer that had gone bad. Steve Riley of BetterBeer.com commented on my post, and I was ecstatic to learn of the services provided by Better Beer®. 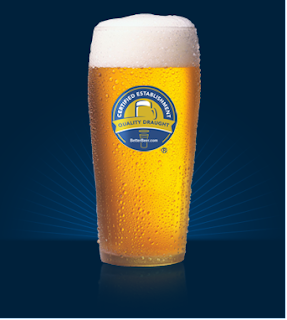 Better Beer® was established by Steve Riley - one of the few Certified Cicerone®'s (beer connoisseurs) in the world. Through the Cicerone® Certification program, one learns of everything one would need to know about beer storage, styles, flavours, flaws, brewing, and food pairings. It takes a dedicated, true beer lover to achieve this certification level, and Riley's dedication is definitely shown through BetterBeer.com. As a fellow beer drinker who dislikes drinking beer that has gone bad, Steve Riley put together a team of trained beer and restaurant auditors who test and "Better Beer® certify" bars and restaurants in Ontario each month. He is not only helping the good beer cause, but is also training staff, workers, reps, etc in quality draught beer serving, so others can be part of the quality process as well. The "Better Beer® certified" establishments in Ontario are listed on Better Beer®'s website, which includes a call to action to beer lovers: "Don't see your favourite spot listed? We'll call them." Asking Better Beer® to contact your fave watering hole to see if they'd like to be Better Beer® certified doesn't necessarily guarantee they'll go for it, but the odds are greatly increased if you do. You never know - if your fave pub hears about Better Beer® and wants nothing more than to learn how to provide proper quality draught beer to you, you win. You can also keep winning by sending back bottles of beer and draught beer that's gone bad when you're out at bars or restaurants. If the bars don't know they're doing something wrong, they'll just continue to do it. That was a lot of ®'s.